Facebook is your social networking destination! Facebook embedded video gives you the ability to host, embed and share the videos you uploaded to your Facebook account right onto your PageCloud page, so there is no need to host the video files elsewhere. To add a Facebook video, first navigate to the link below to select the video and set up the embed code. Next, Copy the embed code and paste it where you'd like it to appear on your PageCloud page. 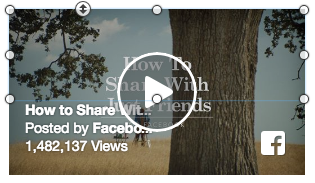 Click Save, and View Live to see your Facebook embedded video in action.